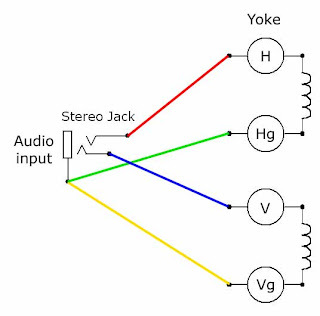 Using TV to display audio signals. This is it all in one. Before we begin, I have to give everyone a warning. DO NOT ATTEMPT THIS PROJECT! MODIFYING TV IS A DANGEROUS PROCESS. 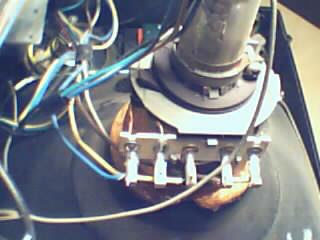 DEADLY ELECTRIC SHOCK, AND THERE IS THE POSSIBILITY OF FIRE OR EXPLOSION. 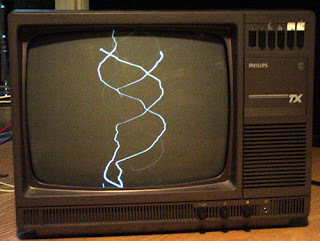 the non-isolated line power supply and the CRT high voltage. Stay away from the red cable with the suction cup end. After you have opened the TV unit wear rubber gloves! 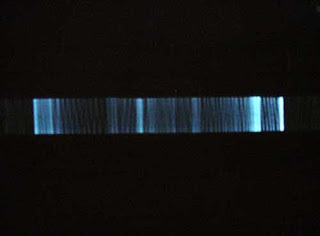 generates a magnetic field and use it to direct the electron beam in the cathode-ray tube. 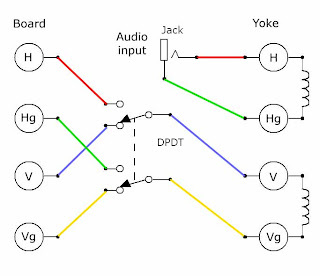 Deflection Yoke gets signals from deflection circuit. 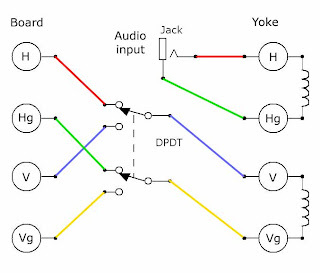 signals whit amplified audio signals and then controll the beam by the audio signal. 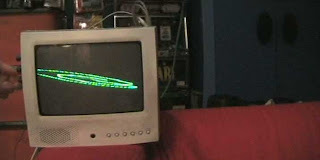 schematics are based on information from censtron.com Wave Vessel page and my own experiments. 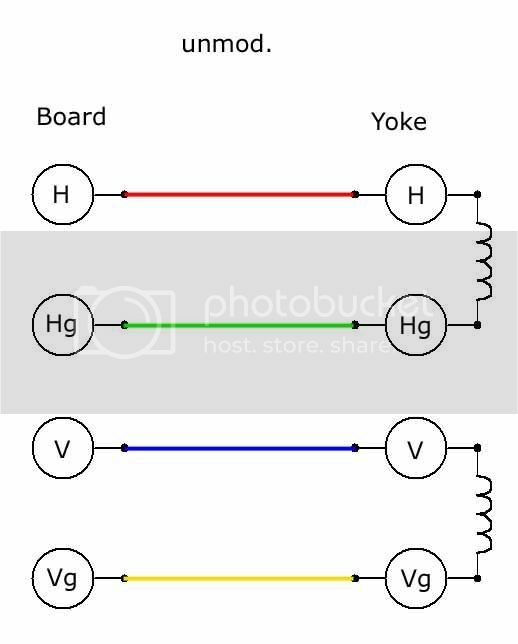 first you need to find out the two horizontal and two vertical wires. 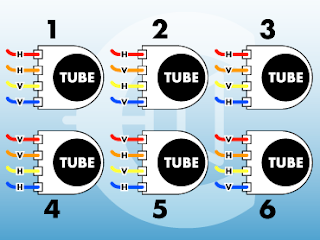 "The diagram above shows all six possible wire combinations. 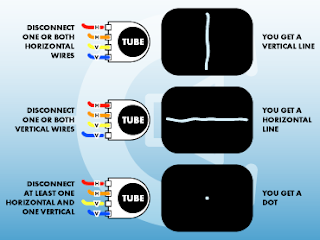 The diagram is drawn from the angle of looking directly at the back of the tube. The colors I used are just for reference,and may be different depending on the model of the television." "First clip and strip all four of the wires going to the tube, then connect them all back up using alligator clips. 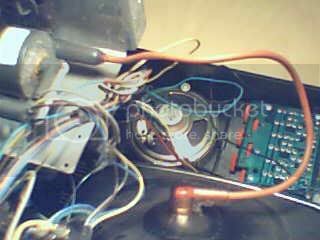 three wires to determine which direction each controls." Whit this you can see normal TV programs. Whit this setup you get vertical line that vibrates. Here is the stereo version. 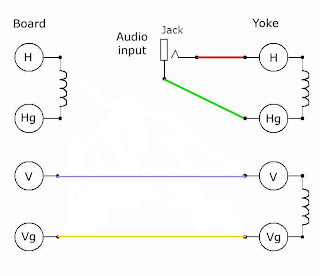 from the winding could be used in the flyback-based high-voltage circuit." Okay i did find the extra yoke but, it was not the right type. The picture was extremely bright! i mean really really bright. 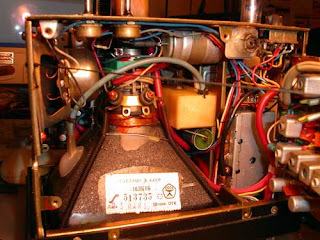 fuses were burn and the unit was extremely warm. Then i noticed there was a X-ray warning on the tube :" do not drive the CRT whit too much current/voltage or it will start produce X-rays. 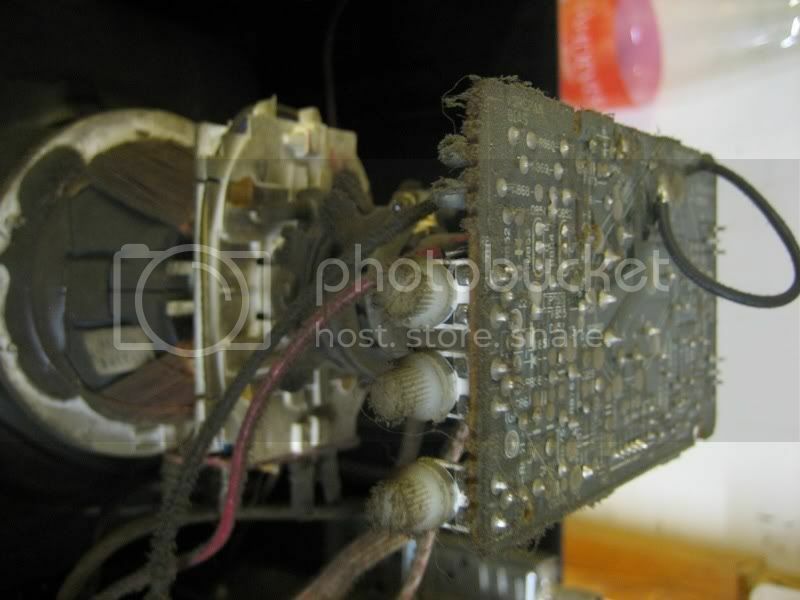 So what i assume happened is that i drived the CRT whit too much voltage/current and it started to produce X-rays! and after that the tube has collapsed. To get symptoms from X-rays you need to get at least 100Gy. The symptoms are then the same type of skin burns you get from sun. in the front. 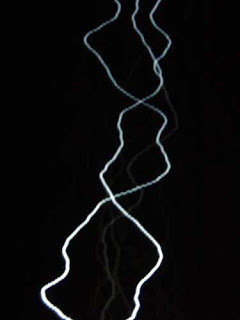 The X-ray born's when electrode hits the phosphor wall. X-ray bounces back to the inner walls of tube. it keeps bouncing and gets weaker and dies. really small amounts of radiation. 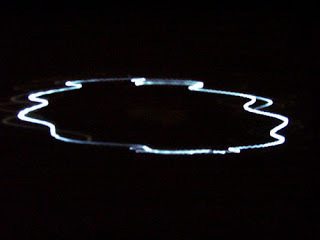 Circuit(Board) - and wow it was cosmic again. - the beam was so bright - it was just like looking to sun. almost the whole gig and died of over heating. I have to say that no TV has ever be so bright! 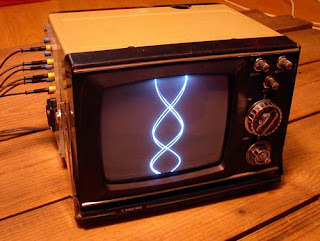 so i have been looking for the next TV (victim) to my experiments. I got now a correct size coil from the broken Philips TX. "We just finished making the first Color Wave Vessel, with it you can now make the visualizations any color from invisible to white." 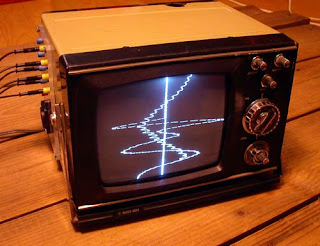 My Friend gave me a old soviet travel-TV that was not working but, it could display the usual noise. 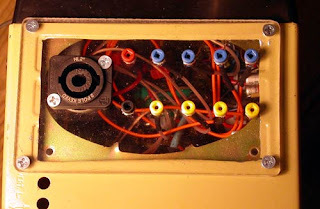 I did the things described in this article (whitout the extra coil)- whit a 2mm pinjack -patch panel and speakon connector - so i can connect straight to my amp. I tryed whit a color unit and gues what, it's really easy, the scope mod its the same as whit B/W tv's and the color adjuts mod is done by soldering of three potentiometers from the back of the PCB that's in the back of the CRT. and mounting new potentiometers to the case. here is a pic of the pots that needs to be taken of and replaced by a same value.